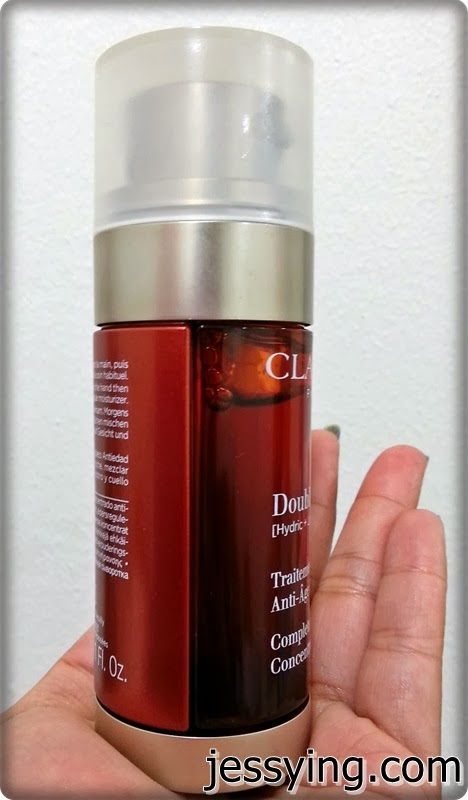 Clarins Double Serum has been around for about a year plus and even though I managed to get a bottle to try back then but then did not pay much attention to it because I did not see much result. Recently when I ran out of serum, I think why not give this another chance to try? After all this Clarins Double Serum is highly raved by my girlfriend Juli and Clarins claimed that 90% of Asian women agreed that Double Serum is more effective than their regular serums. Clarins combines TWO powerful serum in one bottle, giving you TWICE the anti-ageing power with unique booster properties based on cell communication. It's unique formula of Hydric & Lipidic system (water & oil soluable) combines two formulas in one optimum golden ratio which replicates the model of hydrolipidic film, similar to the nature of the skin's natural protective barrier. The two separate phases-presented in side-by-side vials enable the otherwise impossible combination of water and oil soluble ingredients with no risk of incompatibility or instability, and without recourse to emulsifier. With this design, Clarins guaranteed each pump produces “Golden Ratio” of the formula 80% serum and 20% oil. Interesting ya? Clarins Double Serums consists of 20 plants ingredients and one of the ingredients is Clarins exclusive discovery which is Cangzhu extract which targets the G protein and thats the key of cell vitality as it helps to boost the effectiveness and performances of other active ingredients by improving receptivity of cells to external message. 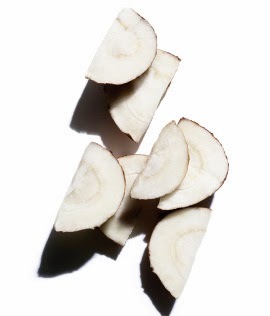 This vital extract also stimulates and revitalizes the skin's 5 vital functions for a more radiantly youthful skin. - Katafray bark extract, hyaluronic acid : moisturising. - Organic perilla and macadamia oils: nourish the skin. - Organic quinoa and green tea extract: protective action. - Maritime pine extract, organic rosehip oil: oxygenize the skin. - Organic green banana extract, thyme and bocoa: regenerating action. 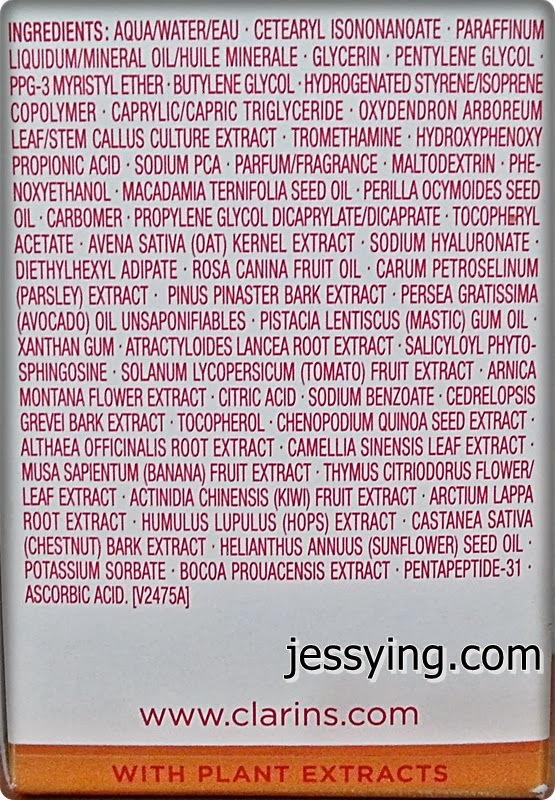 Spotted there is mineral oil in the ingredients list. My review : My first impression of this Clarins Double Serum is that the it's highly perfumed (it was created by Japanese master perfumer). Usually I'm a big fan of Clarins's scent but this fruity/foral scent is a little bit too strong for my liking and luckily the scent lingers for a while before it completes fades off. The texture of of the serum is light but oil base, hence it needs to be warm up using palm before applying. It absorb pretty well though I do feel a layer of filmy texture on top. It is recommended to use 3 pumps in the morning and/or evening before our usual moisturiser. 3 pumps is too much for my face hence I used it to apply my whole face and my neck too. After a month of using Clarins Double Serum together with Clarins Extra-Firming Day & Night moisturiser. the only improvement I felt were my skin is a little bit firmer than usual. However I was a little bit disappointed when I did not see any other results. To me this works as an anti-ageing preventive serum rather than treatment serum and this would suits women 25 years and above. And I would personally prefer Clarins Hydraquench Serum over this any time.